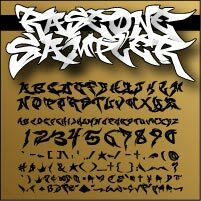 RaseOne is a full featured graffiti font featuring two entire graffiti alphabets. Also included are all numbers and punctuation as well as over 100 graffiti symbols. Using different combinations of the two alphabets, numbers and symbols you can create endless amounts pieces. 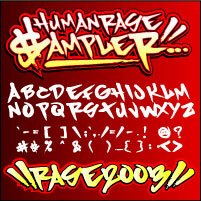 Human Rase is a full featured graffiti font featuring one hand written graffiti alphabet. Also included are all numbers and punctuation as well as dozens of other text and graffiti symbols. The latest build of this font uses virtualy the same characters for the uppercase and lowercase keys. NewDigital is a full featured graffiti font featuring one mechanical graffiti alphabet. Also included are all numbers and punctuation as well as dozens of other standard text symbols. 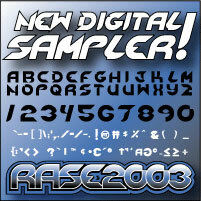 The latest build of this font uses virtualy the same characters for the uppercase and lowercase keys. The new Graffiti Fonts™ Collection ver. 1 includes all three of the original Highground Graffiti Fonts shown above for PC, Mac and Linux computers as well as a collection of graffiti fonts from Johan Waldenstrom. 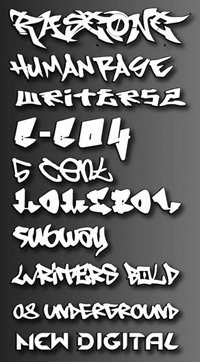 This is the most complete collection of graffiti fonts available right now and its the only one available on CD. Also included is the Opcion Font Viewer. Opcion is a simle JAVA based font viewer that runs on any operating system. You can use it to preview the fonts on the CD or anywhere on your computer. The updated version 1.8 of the CD features over 14 graffiti fonts in all. ... and more. The collection includes tag style, burner style and stencil style fonts for whatever look you are trying to achieve. Some of these fonts have been used on major projects with worldwide exposure while the Highground fonts have just been released and few people have even seen them. EXCLUSIVE GRAFFITI FONT COLLECTIONS - 3 levels to fit your needs & budget. All Typefaces and artwork are copyright © Highground Industries & Fulltime Artists unless otherwise noted. Unauthorized duplication is strictly prohibited. Fonts, Art and all other materials on this site are wholely owned by thier creators and may not be redistributed in any way or under any other name without advance written consent.